Here we witness the shift from a mechanical conception of the body where the parts work independently of each other to an organic conception where the parts work interdependently with each other. This is most evident in what we know as weight shift where the artist distinguishes a weight bearing leg versus a free leg. As you can feel in your own body as you shift your weight from one leg to the other, the axes of the body respond to the shift. The hip of the weight bearing or engaged leg is higher than that of the free leg. This is a pose that we call contrapposto. Note how this principle of the interdependence of the parts extends to the treatment of muscles. In your journal, list details that support this. Psychologically there is a profound shift between the archaic and classical figures. In your journals, imagine standing in front of these two works and consider the different psychological or emotional relationships these works create with the viewer. The aim of the Canon, was not simply to explain a statue but also to achieve to kallos, "the beautiful and to eu (the perfect or the good) in it. The secret of achieving to kallos and to eu lay in the mastery of symmetria, the perfect "commensurability" of all parts of the statue to one another and to the whole. Beauty, Chrysippus feels, resides not in the commensurability (symmetria) of the constituents (i.e. of the body), but in the commensurability of parts, such as the finger to the finger, and of all the fingers to the metacarpus and the wrist (carpus), and of these to the forearm, and of the the forearm to the arm, in fact of everything to everything, as it is written in the Canon of Polykleitos. For having taught us in that treatise all the symmetriae of the body, Polykleitos supported his treatise with a work, having made a statue of a man according to the tenets of his treatise, and having called the statue itself, like the treatise, the Canon. Polykleitos's idea of symmetria and the pursuit of the to kallos and to eu was probably influenced by exposure to the ideas of Pythagoras of Samos ( active in the late sixth century B.C.) and of his followers. Pythagoreans were concerned with finding some underlying pattern in visual phenonmenon. Their fascination with number was directly connected to this belief that in number can be found the key to physical bodies but also of abstract qualities like justice. As a demonstration of this principle, they explored musical harmony and noted how the intervals needed to produced harmonic chords on the string of a lyre were expressible in a limited group of integers ( 2:1, 3:2, 4:3,etc.). This led Pythagoras to search for these patterns in other visual phenomenon like the movements of the planets and the relationships of the stars. He believed that these underlying harmonic proportions could be found throughout nature. Architectural historians have seen proportional relationships as important in the design of buildings like the Parthenon. These patterns of proportions demonstrated the Greek conception of nature as cosmos. This search for patterns of proportional relationships in the human body and in the world, led to the idea of the relationship of the human body to the world or cosmos as a whole or the relationship of the microcosm or small world/ the human body to the macrocosm or whole world. This is an idea developed by the Greeks that will be influential in later Western civilization, especially the Renaissance. It also establishes the special position of the human body in creation. In the figure note how the two sides of the figure are opposed with the left side as the straight side (straight arm and leg) and the right side is the bent side (bent arm and leg). These oppositions are then balanced with the contrast between active and passive parts of the body: the leg to our left is active (engaged) and is echoed across the figure with the arm supporting the spear. The leg on our right is passive (free leg) and echoed by the left arm that is relaxed or passive. The balancing of the figure is further evident in the chest turned towards our right while the head turns towards our left. The lowered left shoulder is balanced by the lowered right hip while the raised right shoulder is balanced by the raised left hip. The work can thus be seen as a harmony of the opposites much like the cosmos was seen in Pythagorean thought. 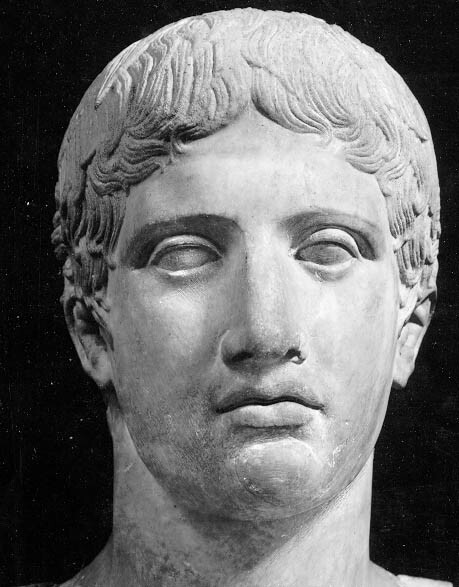 As mentioned above Polykleitos's intent in creating the Doryphoros was to give visual form to what he considered to be to kallos, the "beautiful," and to eu, "the perfect" or "the good." He was attempting to give visual expression to an ideal conception of human nature or what he saw as a reality that transcended empirical observation. Polykleitos's conception of reality should be understood in relationship to those expressed by Plato, as famously expressed in the "Allegory of the Cave" found his dialogue The Republic (see Wikpedia discussion of the Allegory of the Cave and the cute claymation version) . 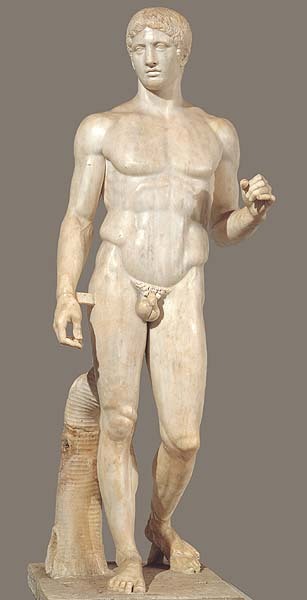 Consider how we need to qualify our popular notion of "reality" when we consider a work like the Doryphoros. We are missing the point if we see Polykleitos's intention was to create an accurate record of visual experience. Like Plato, Polykleitos saw true reality as a world of forms of which things of immediate visual experience are reflections or shadows. For a 360 degree view of the Doryphoros. Art Bulletin review of Polykleitos, the Doryphoros, and Tradition.